Dearest Blog: Yesterday I took a pass on the company picnic (Outdoors? In July? Are they kidding?) to head up to Marquee Cinemas and catch up with Jason Bourne. Spoiler level here will be mostly mild, nothing plot-specific, but I do offer an opinion at the end that some might consider slightly spoilerish. If you're worried, read after you've seen it, please! 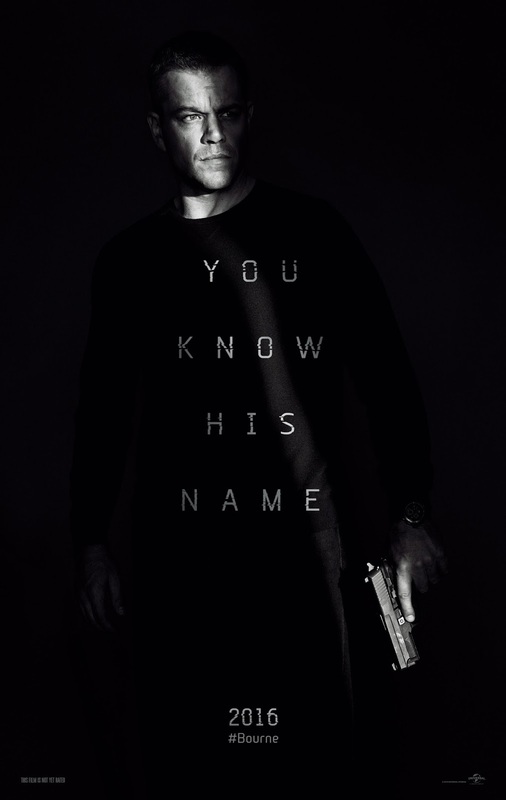 Jason Bourne is back with a vengeance, looking for answers and on the run for his life. Ahhhhhhh...dear Reader(s)...remember the good not-so-old days when Jeremy Renner appeared poised to take the reins of both the Bourne and Mission Impossible franchises? There's nothing wrong with Matt Damon, of course, but you may count me among the silent minority that would have enjoyed this picture a lot more with Renner at the fore. Jason Bourne kicks off with a chase scene that outlasts even that one from Jupiter Ascending that put me to sleep three times and was still rolling when I woke up. I mean, this thing GOES ON. The sequence includes some pivotal moments, but it also highlights one of the movie's key weaknesses right out of the gate: too much filler. Jason Bourne has more running than a Ten-era Doctor Who episode and enough vehicular carnage for a Transformers movie; had filmmakers exercised even a bit of restraint, they'd have had a far better end product. Much of the action is filmed in up-close-and-personal fashion. The fight scenes are brutal and well executed, but the wiggly camera work is enough to trigger a seizure. It's a passable tactic when used wisely, but, here, again, there's just too much of it. Damon is appropriately grim in the lead, his sour expression a constant reminder of the Very Serious Situation at hand. Oscar winner Alicia Vikander is a disaster, bringing all the dimension of a paper doll to her important role, while struggling mightily to hang onto the same accent for any two consecutive scenes. The rest of the supporting cast is unremarkable, but fine for what's asked of them. The story is no more or less convoluted than any other installment in the series, sure to leave questions if (like me) you've mostly forgotten the earlier films, but not so deep that any fan of action flicks couldn't enjoy it even if he'd never seen a Bourne movie before. Finally, as if Jason Bourne weren't enough of a jumble, three-quarters of it feels very much like an ending, but the last act does a complete about-face and clearly sets the stage for more. Jason Bourne clocks in at an excessive 123 minutes and is rated PG13 for "intense sequences of violence and action, and brief strong language." Boasting action a-plenty and a solid cast that deserves better, Jason Bourne is, unfortunately, a bit of a snooze. Of a possible nine Weasleys, Jason Bourne gets four.